Honey, raisin, apricot, spice, and a slight earthy peat smoke. Sweet, honeyed subtle fruitiness (peach, mango, apricot) with hints of earthy smoke and wood spice. Soft, sweet, light smoke and wood spice. Johnnie Walker Gold Label Reserve is adored for its smoky, spicy, apricot and earthy flavor notes. This Scotch is carefully distilled at Johnnie Walker distillery. 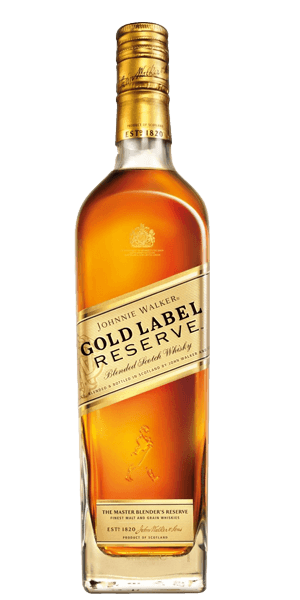 Based on 93 votes, the average rating for Johnnie Walker Gold Label Reserve is 7.8/10. — It is a classic, delicate, 18 Year Old Blended Whisky with a honeyed life, that leads to a long & soft death with a hint of spice! Smooth, drinkable, simple. I certainly wouldn't turn down a glass if it was on offer, but its not a thinker and doesn't do much to hold my interest. New go to. Fruit with Smokey finish. I found this blend very enjoyable and a nice addition to my collection. It is a classic, delicate, 18 Year Old Blended Whisky with a honeyed life, that leads to a long & soft death with a hint of spice! Sweet and smoky, smooth at palate with notes of honey, raisins and peppermint with a bit of earth. Medium-long aftertaste of vanilla and oak. For me this is a fantastic drink, and great value for money. Definitely my go to whiskey. Superior to Blue Label and at a better price point! What's not to like? It's ok. Green label is better.